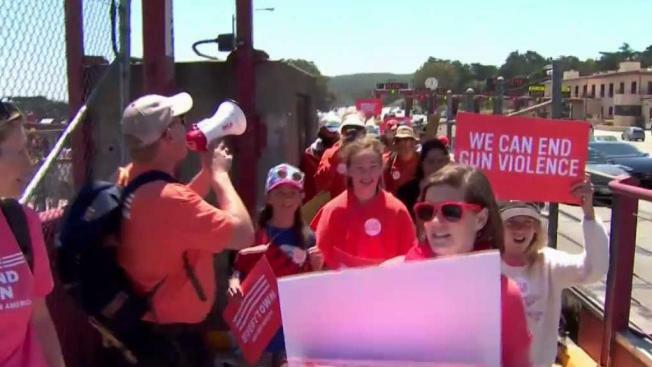 Dozens marched across the Golden Gate Bridge Saturday to raise awareness for gun violence on June 2, National Gun Violence Awareness Day, and events are taking place all over the Bay Area in recognition. Christie Smith reports. Dozens marched across the Golden Gate Bridge Saturday to raise awareness for gun violence on June 2, National Gun Violence Awareness Day, and events are taking place all over the Bay Area in recognition. Narkethia Griffin lost her son to gun violence and she said she's marching because she doesn't want any mother to feel the way that she feels, to "endure this pain." Holding orange signs that says "WE CAN STOP GUN VIOLENCE," people trekked across the 8,981-foot bridge from Marin County as well as from San Francisco. In Redwood City, Mothers Demand Action held a rally to honor the lives lost everyday from gun violence. The organization works towards gun sense legislation but Sheila Brar, the volunteer spokesperson for Peninsula Chapter of Moms Demand Action, says Saturday's rally is just to honor gun violence victims' lives. "Ninety-six lives lost each day is 96 too many," Brar said in her bright orange t-shirt. Wear Orange was inspired by friends of Hadiya Pendleton, a 15-year-old Chicago student killed by gunfire, who decided to honor her life by wearing orange-the color hunters wear in the woods to protect themselves, organizers said. Many teens were at the rally Saturday, inspired by the young people who became vocal about change after they survived a mass shooting at their Florida high school that killed 17 people. "I think that just by having younger voices show up, we are able to show a lot of lawmakers that we are not going to back down and we are the future generation coming to vote," Mill Valley High School senior Zoe Wynn said.